How to maximize fat loss by eating the right food at the right time. Getting in top shape is not necessarily about a restrictive diet or endless workouts for your client. Yes, it's important to get them to eat right and train smart, but in reality, it's about consistency and attention to detail. In addition, the body has very different metabolic needs at different times of day and under differing circumstances. Here's a breakdown of what is going on in the body throughout the day, what it needs at that time, and what food combinations will address those needs so fat-loss and muscle-building efforts are optimized. Carbohydrate energy reserves (glycogen) are low. Muscles are in a mild catabolic (muscle-wasting) state. Fat stores are also slowly being mobilized and burned. This will be one of the most important meals of the day. Many of the calories will go toward replacing glycogen reserves and halting the catabolic activities in the body. Protein: Use a fast-acting protein that will be absorbed easily and quickly, providing available amino acids. Carbs: Try a mix of simple and complex carbs. Fat: It is important to get a good dose of essential fatty acids (EFAs-mono- and polyunsaturated fats) in this meal. You can use flax seed oil or canola oil to cook in or add to any of your other foods. Having some walnuts, soy nuts, or sunflower seeds can boost essential fatty acid intake. At this point, the body will be rebounding a bit from its muscle-building breakfast. Blood sugar levels are probably trailing off. Provide muscles with enough energy and sufficient protein to keep them out of catabolism. Support a moderate and even blood sugar level. 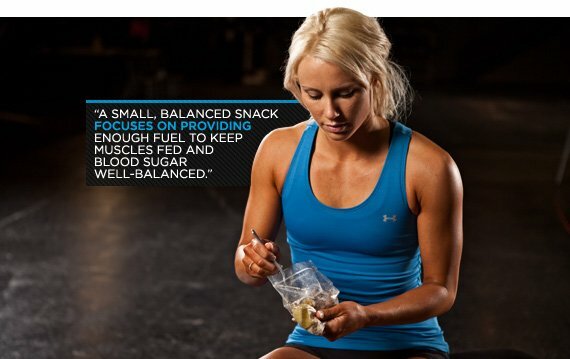 This is a small, balanced snack that focuses on providing enough fuel to keep muscles fed and blood sugar well-balanced. Protein: Try a mixed protein source that will provide some quick amino acids and additional ones over 2 to 3 hours. Milk is a good choice, as it contains both casein and whey. Or, try a balanced meal-replacement shake providing a mixture of proteins, preferably casein and whey. Carbs: Focus on getting a moderate amount of low glycemic index carbohydrates The meal-replacement powder and milk will provide the carbs you need. The mid-morning snack may have worn off. Sustained energy may be needed for afternoon activities. Continue to support a moderate and even blood sugar level. This is the second largest meal of the day. Protein: Try a mixed protein source with more emphasis on the fast-acting proteins such as chicken, fish, whey, or egg. Wilting muscles need to be fed a solid dose of amino acids. But you also want to have some protein to carry over until your next snack. Carbs: Focus on low-glycemic carbs, without a whole lot of sugar. Fat: This is another opportunity to get in a good dose of EFAs. If you eat fish at this meal, you will naturally get some EFAs. If not, add EFA-rich foods, just like at breakfast. Blood sugar levels have gotten a bit low in a rebound response to the calorie dose at lunch. Muscles are likely to be slightly catabolic. Ease blood sugar levels back up. This is a small, balanced snack that focuses on providing enough fuel to keep muscles fed and get blood sugar back on track. Protein: Use a fairly slow-acting protein. Casein is a good choice because of its slow rate of digestion. There are many nutrition bars that are casein-based (eg, milk protein concentrate) that would work well. Carbs: Focus on carbs that will mildly elevate your blood sugar. Look for a nutrition bar with low sugar content. Glycogen reserves have burned up working out, so they are depleted. Blood sugar has been used up and is low. but very ready to soak up nutrients and turn anabolic. This is the time when the body can quickly absorb fast-acting protein like whey. All those nutrients will quickly shuttle their way to muscles, jumpstarting recovery and rebuilding. Depending on when the workout occurs, replace any of these meals throughout the day with a protein smoothie made from EAS Lean 15, which contains a blend of fast-acting whey protein and slow-acting casein protein, which will help keep appetite in check until the next meal. Mix 2 scoops with skim milk or water, ice cubes, and frozen fruit (if you choose). Blend well and enjoy. Then continue regularly scheduled meals. For an optimized post-exercise meal, a good rule of thumb is to consume 1-3 grams of carbohydrates for every 1 gram of protein intake. Overnight your body will be mostly anabolic (muscle-building) up until about midnight to 2 am. Then it typically turns catabolic, burning glycogen, muscle, and fat. Turn muscles from catabolic to anabolic. Sustain the overnight anabolic state as long as possible. Help your body focus on using fat for energy versus muscle protein or glycogen during the later catabolic stage of sleep. This is when it pays to keep the carbs low and pack in the protein. Also include a moderate dose of fat in this meal. Protein: You want to focus on slow-acting protein because in order to help fuel muscles all night, you want a protein that will release amino acids into your bloodstream throughout the night. Two good choices for the slow-acting protein are lean red meat and casein. Carbs: Focus on fiber-rich, low-sugar sources of carbohydrates. Fat: Add good sources of fat to this meal. Examples of these fats include canola oil, olive oil, nuts, and seeds. The ultimate resource for understanding the science and application of sports nutrition. To propel the science of sports nutrition forward, one athletic trainer, one dietitian, one coach, and one athlete at a time. Now's your chance to become an EAS Sports Nutrition Insider, where you'll have access to exclusive "trainer only" content on EASAcademy.org, the latest in nutritional information, coupons for you and your clients, new product sampling, VIP loyalty cards, CEU programs, and the opportunity to be featured/recognized on EASAcademy.org and in EAS Sports Nutrition Insider. Registering is fast and easy (and we'll never share your information with any outside third party). Once signed up, you'll receive periodic e-mails to alert you when new content is available, as well as current news, upcoming events, and special promotions. For More Nutrition Tips, Visit EAS.COM.